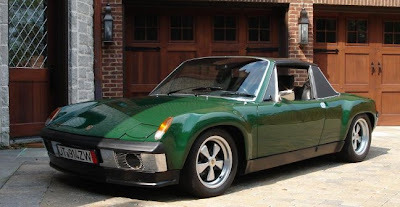 A doctor who lived with us sold this Porsche 914 to me. (A VW in Europe I understand). With its mid-engine and low center of gravity it would scream to take corners at 60 or 70 mph. Or maybe that was my passenger screaming? The transmission linkage went under the engine and back into the engine from the rear. You think that might lead to some issues? The mid-engine was a VW air-cooled engine, that for some reason needed to have the valves adjusted, like, every week? I remember using it to tow a refrigerator tied to a hand wagon, and tied to the back. It brought back all the Midget memories (including the BRG color) except this was like a family size car (compared to the Midget). It seemed even lower to the ground. It was not the most dependable, and when the transmission finally started to be problematic - on a daily basis - I had to get get something more reliable - oh what a mistake I made. I wish I had kept this fun to drive classic.